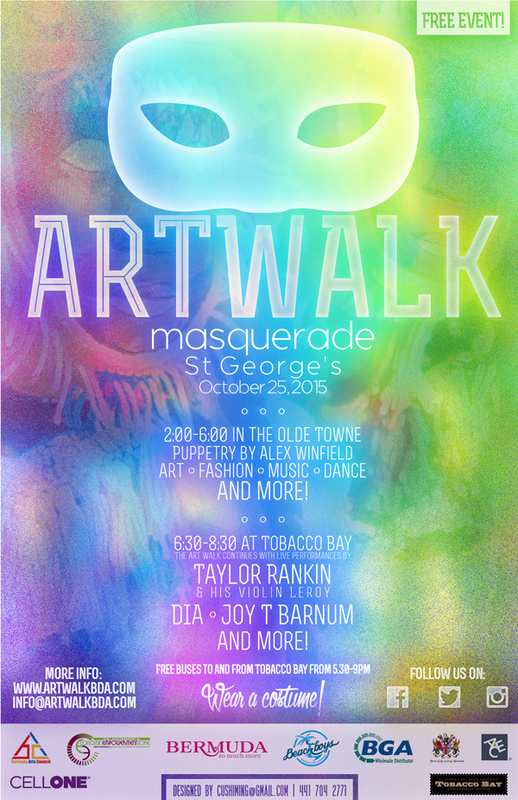 The Bermuda ArtWalk is set to be held on October 25, marking its sixth event in St. George’s, with the theme ‘Masquerade,’ taking place from 2.00pm to 6.00pm in the Olde Towne, continuing from 6.30pm to 8.30pm at Tobacco Bay. “And it’s not too late to share your own creative spark. There is still opportunity for buskers, artists and vendors to get involved and participate in Sunday’s event, which will run from 2.00pm to 6.00pm in the Old Towne followed by a shuttle to Tobacco Bay for a performance at the beach from 6.30om to 8.30pm, all free. “This time, puppeteer and theatre maker Alex Winfield will be engaging audiences in the streets of St. Georges and Taylor Rankin, his violin Leroy and drummer Dwight Hart will entertain at Tobacco Bay. “Numerous other local acts will be showcased and other organizations are contributing to the event, such as Kaleidoscope Arts Foundation and the Garden Club. There will be a Plein Air competition that day with a cash prize, and The St. George’s Olde Town Market will also be on during the event. “St. George’s is the perfect stage for this event and we are excited to participate in efforts to enliven and showcase the Old Towne,” said event organizer Ami Zanders. For more information, visit the ArtWalk website or Facebook page, or email info@artwalkbda.com. st.geo is worth a look! Thank you Ami for working tirelessly to bring the ARTS TO THE EAST! Your efforts need to be recognized and this event needs to be supported and properly funded. The Art Walk in the East gives opportunities to performing & visual artists of all ages, experiences & backgrounds to showcase what they do whilst bringing a vibrant event to a town in dire need of activity! I hope that a key sponsor will step up and give you the ongoing funding that you deserve! Keep going & thank you!